Abyssic are the orchestrated death/doom band of Susperia bassist, Memnoch. He started the group in 1997 under the moniker Abyssic Dreams, and recorded a two-song demo with Susperia bandmate Athera. Then he put the band on hold to concentrate on Susperia. 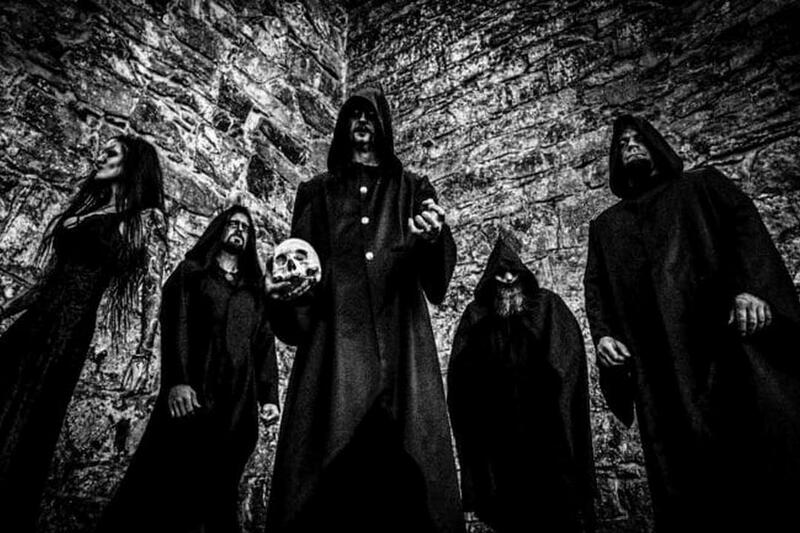 Nearly twenty years later, Memnoch brought Abyssic Dreams back from the dead, shortened the band name to Abyssic, and released their debut A Winter’s Tale in 2016. Susperia bandmate Elvorn was instrumental in the band’s resurrection. André Aaslie added the most important element to Abyssic, keyboard orchestrations. Abyssic would not possess the cinematic flair and atmosphere without Aaslie’s dramatic orchestrations. The group is on the verge of releasing their sophomore album, High the Memory. The album shows Susperia mate Tjodalv replace Asgeir Mickelson (Ihsahn, ex-Borknagar) on drums. High the Memory is a grandiose effort of epic length. The five-song track list clocks in at over a whopping seventy-seven minutes. This is perfect timing for an album that moves with such slow deliberation. Not quite a funeral doom procession, there are mid-tempo moments. The album still moves with deliberation with long notes saturating ear drums with huge atmosphere. Guitarist Elvorn spoke with Heavy Music Headquarters about the making of High The Memory and how the world would have known the name Abyssic much earlier had it not been for Susperia. Darren Cowan: How do you feel about the album? Elvorn: I’m very pleased. It’s been a long process. We’re finally done and satisfied with the results. Now we can relax a bit. We were done with recording in November. It’s been a year to record everything. The cover art had to be in place. Now, we are looking forward to the release on 22nd of February. How does it compare to your debut, A Winter’s Tale? We had to do something as good as it, even better, and also in the same spirit. Everything on High The Memory is basically a continuation of A Winter’s Tale. It’s the same way with the cover artwork, the more epic songs and the more mid-tempo songs. We have basically the same feeling, but it can be difficult to try to improve yourself, always make a better album. We were more picky this time. You’ve worked with drummer Tjodalv in Susperia. What led to him joining the band? That happened because our previous drummer Asgeir [Mickelson] didn’t have the time to play any live concerts. He was just too busy. We needed a drummer who could be all in and play live with us as well. Also, it was the location where we live. It was just natural for Tjodalv to join. He loved our first album. He loves what we do. Of course, we know him from Susperia. It was just the natural way since Asgeir couldn’t continue in Abyssic. There was no drama. That’s just the way it is with bands sometimes. We were happy with Asgeir. He did a great job on A Winter’s Tale. We also needed a drummer who was equal in technical skills as well. High The Memory is a mix of death/doom, cinematic orchestration, symphonic black metal and prog. Listeners can hear Mellotron, minimoog and upright bass played by Memnoch. How do these extra instruments add to the orchestration? What mood/vibe are you pursuing? All of us have different musical influences, but we all love this doom and black metal atmosphere, which has been a part of me for most of my life. Then you mix it with André [Aaslie] on the keys and orchestrations. He’s the one into prog metal. It just fits to put in all kinds of elements from different genres. It has a symbiosis of black, doom and prog. Of course, we are a doom metal band. Doom metal with a capital “D.” Death/doom is how we define ourselves. It’s not black metal at all, but of course, we have those feelings, those touches, in the music. We just integrated it. The same way we put some prog in it. We put some black metal in it, but it’s a doom band. Those elements separate you from a typical death/doom or funeral doom band. I totally agree. That’s the same thing with the upright bass. It’s massive. It is doom. You can feel the abyss when one is playing it. Also, there is the choice of vocals, but we have a few more up-tempo parts than funeral doom. We try to do our own thing. It’s not like we are inventing anything, but we still try to do our thing and make our sound. It’s not original in that way, but it’s we try to create our own sound with elements from all these other genres. The result is orchestration and the upright bass. Does Memnoch play guitar, too? No, I do all the guitars. He composes riffs on the guitar, but he doesn’t play guitar. Sometimes he makes riffs and sends them to me or we’ll sit together and make riffs. Then we send it on to André and he makes his orchestration. I am the guitar player in the band, live and on record. How did you two align your guitar with the swell and collapse of the keys? It’s a challenge. Our music is not guitar driven. You have to make room for everything. It’s a big picture, a big sound. You need to have all the elements to integrate them. It’s not a guitar based album in that way, but the guitars have to be massive and cold. We put a lot of effort in the integration, and of course, the upright bass, bass guitar and vocals. It’s a process. The mixing process was (laughs) quite a challenge. It worked out well. I don’t want to do too much on the guitar. I don’t want any solos in a technical way. It’s not about technical skills on the guitar; it’s more about an atmosphere, feeling and power. We also want a raw sound. You can feel the guitar in your chest pumping. That’s the basic idea about the guitars. It has a big sound and deserves to be played loud. Yes, play it loud. It’s not background music. It’s intense. There is a lot to absorb, to listen to. I would think you need to spin the record several times to get into it. It has long songs. It’s seventy-seven minutes. Some of your songs are very long. There are a couple songs that are twenty-minutes long like “Where My Pain Lies” and the title cut. With the songs being so long, how do you know when they are done? You just feel it, like with André’s orchestration. You just feel it. I tried to answer that kind of question many times. You just feel it and then it’s done. We don’t use a clock or anything, just whatever feels natural for the composition. Sometimes it can be 10 minutes or less. On the debut album, we have a twenty-eight-minute song, the title track. On the new album we have the opening cut “Adoration,” which is eight-minutes long. It’s the shortest song we have (laughs). Then we have the title cut that is twenty minutes, “Transition Consent,” which is 12. We just have a lot to play. I enjoy long songs. It could be a long song, I don’t care. With Abyssic, it’s just one composition. What is the meaning of the title High The Memory? How does that fit the album? It’s open to interpretation. It’s kind of personal. I don’t know if you have read the lyrics. I don’t write the lyrics, but it’s all about life. It’s a transcending point of view on life, life and death. High the Memory; we felt the title was fitting. It’s some of the thoughts and experiences we have, good and bad. With Memnoch writing lyrics it could be about a nightmare or experience and other experiences from writers and books he’s read. It’s very personal music. It’s not made for anybody else except ourselves. It doesn’t matter if it sells. Putting out songs that are twenty-minutes long is commercial suicide, but that’s fine. People don’t like it, it’s fine by me. It’s also fantastic if they like it! The music you play will never be mainstream. No, it wouldn’t. We are happy about that, in a doomy way. It’s ironic when you say “happy” in doom or black metal. In 1997 Memnoch founded Abyssic Dreams and recorded a two song-demo together with drummer Athera. Not much happened after that as they focused on Susperia. Memnoch is your band mate in Susperia. How did he bring you into the band? I remember the time he recorded those songs and I listened to them. It was cool, but then everything happened with Susperia and he put everything on ice. He always talked about me joining him to do the guitars at that point, as well. Nothing happened because he was too busy. Around 2012, I found these old demos that he made about twenty years ago on my hard drive. I listened to it and thought it was cool. I called him and said, “do you remember those old songs from Abyssic Dreams? We should do something about it.” We started to get out these kinds of feelings that we had inside. Then we met André at a party and they started to talk. I wasn’t involved all that much in the beginning. He called me and said he met this guy who does all these orchestrations. He’s brilliant at what he does. Memnoch sent him some riffs and he sent me some riffs. Then, I joined them on a permanent basis later on. The band was formed. That’s the short version of the story. What’s next for the band? Have you lined up any gigs? Yeah, we’ve played several gigs. We did some festivals and did a tour in Europe. We are going back with Monolithe, a French doom band, which is the 12th of April, for a ten-day tour. We have some festivals and hopefully more tours. We are going to try to do a lot of live shows in the future. And of course, we need to start making the new album now. We have a lot of ideas that we put together. So, we want to play live, make the next album and the album after that, if it comes to us. It’s not like any of us are sitting down and forcing a composition in Abyssic. It’s just something that needs to happen. Sometimes you’re in the mood and creative. Other times you’re not, and that’s fine. I travel to Memnoch’s place in the woods, sip on red wine, play and just talk. Then we send some riffs to André and he puts his touch on it with the orchestration. We start with vocals and the bass. It’s a process. We enjoy it. We don’t have any pressure; we just do it. It takes the time it takes to make. Perhaps, we can make another record in a year, maybe two years. I don’t know. We’ll see. How are you going to split the time between this and Susperia? I do music all the time, so it’s not a problem for me. Sometimes I feel like I’m in a Susperia mood, sometimes I’m in an Abyssic mood or other projects I’m doing, so it really just depends on what kind of mood I’m in. I listen to different kinds of music, as well. Sometimes I want to put on some death metal. Sometimes I want doom metal or even classical music. I also like dark ambient. I listen to different sorts of music. It’s not a problem. Susperia is not an active, live band anymore. Everybody is playing live, so we don’t have the time to go on tour anymore like we did earlier. At the moment, it’s not a problem. We are making a new record with Susperia as well. We have a lot of songs already. We just need to finalize stuff and enter the studio to record it. It’s a process. There is no stress, no hurry.